Dice being thrown in slow motion. The Egyptian game of Senet was played with dice. Senet was played before 3000 BC and up to the 2nd century AD. It was probably a racing game, but there is no scholarly consensus on the rules of Senet. Dicing is mentioned as an Indian game in the Rigveda, Atharvaveda and the early Buddhist games list. There are several biblical references to "casting lots", as in Psalm 22, indicating that dicing (or a related activity) was commonplace when the psalm was composed. It is theorized that dice developed from the practice of fortunetelling with the talus of hoofed animals, colloquially known as "knucklebones", but knucklebones is not the oldest divination technique that incorporates randomness. Knucklebones was a game of skill played by women and children; a derivative form had the four sides of the bone receive different values and count as modern dice. Although gambling was illegal, many Romans were passionate gamblers who enjoyed dicing, which was known as aleam ludere ("to play at dice"). Dicing was even a popular pastime of emperors. 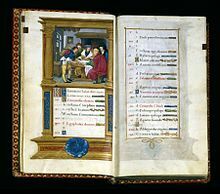 Letters by Augustus to Tacitus and his daughter recount his hobby of dicing. There were two sizes of Roman dice. Tali were large dice inscribed with one, three, four, and six on four sides. 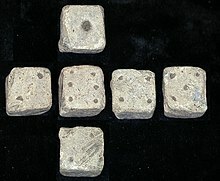 Tesserae were smaller dice with sides numbered from one to six. Twenty-sided dice date back to the 2nd century AD and from Ptolemaic Egypt as early as the 2nd century BC. Dice are thrown onto a surface either from the hand or from a container designed for this (such as a dice cup). The face of the die that is uppermost when it comes to rest provides the value of the throw. One typical dice game today is craps, where two dice are thrown simultaneously and wagers are made on the total value of the two dice. Dice are frequently used to randomize moves in board games, usually by deciding the distance through which a piece will move along the board; examples of this are backgammon and Monopoly. The result of a die roll is determined by the way it is thrown, according to the laws of classical mechanics. 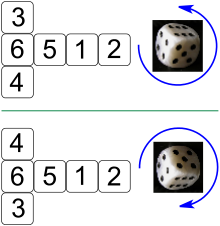 A die roll is made random by uncertainty in minor factors such as tiny movements in the thrower's hand; they are thus a crude form of hardware random number generator. 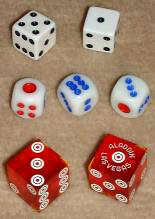 Perhaps to mitigate concerns that the pips on the faces of certain styles of dice cause a small bias, casinos use precision dice with flush markings. While the terms ace, deuce, trey, cater, cinque and sice are generally obsolete, with the names of the numbers preferred, they are still used by some professional gamblers to designate different sides of the dice. Ace is from the Latin as, meaning "a unit"; the others are 2 to 6 in Old French. A loaded, weighted, or crooked die is one that has been tampered with so that it will land with a specific side facing upwards more or less often than a fair die would. There are several methods for creating loaded dice, including rounded faces, off-square faces and weights. Transparent cellulose acetate dice are used by casinos as tampering is more apparent than with opaque dice. A typical set of roleplaying dice in various colors. They consist of the five Platonic solids, along with a ten-sided die that is also used for generating percentages. Each face has three numbers, arranged such that the upright number, placed either near the vertex or near the opposite edge, is the same on all three visible faces. The upright numbers represent the value of the roll. This die does not roll well and thus it is usually thrown into the air instead. A common die. The sum of the numbers on opposite faces is seven. Each face is triangular and the die resembles two square pyramids attached base-to-base. Usually, the sum of the opposite faces is 9. Each face is a kite. The die has two sharp corners, where five kites meet, and ten blunter corners, where three kites meet. The ten faces usually bear numbers from zero to nine, rather than one to ten (zero being read as "ten" in many applications). Often all odd numbered faces converge at one sharp corner, and the even ones at the other. The sum of the numbers on opposite faces is usually 9 (if numbered 0–9) or 11 (if numbered 1–10). Each face is a regular pentagon. The sum of the numbers on opposite faces is usually 13. Faces are equilateral triangles. Icosahedra have been found dating to Roman/Ptolemaic times, but it is not known if they were used as gaming dice. Modern dice with 20 sides are sometimes numbered 0–9 twice as an alternative to 10-sided dice. The sum of the numbers on opposite faces is 21 if numbered 1–20. Disphenoids, an infinite set of tetrahedra made from congruent non-regular triangles: 4 sides. This is a less symmetric tetrahedron than the Platonic tetrahedron, but still sufficiently symmetrical to be face-transitive. Similarly, pyritohedra and tetartoids are less symmetrical but still face-transitive dodecahedra: 12 sides. Long dice and teetotums can in principle be made with any number of faces, including odd numbers. Long dice are based on the infinite set of prisms. All the rectangular faces are mutually face-transitive, so they are equally probable. The two ends of the prism may be rounded or capped with a pyramid, designed so that the die cannot rest on those faces. 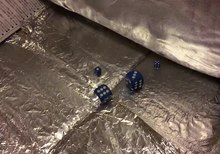 4-sided long dice are easier to roll than tetrahedra, and are used in the traditional board games dayakattai and daldøs. Most commonly a joke die, this is either a sphere with a 1 marked on it or shaped like a Möbius strip. A coin flip. Some coins with 1 marked on one side and 2 on the other are available, but most simply use a common coin. This is a long die intended to be rolled lengthwise. When the die is rolled, one edge (rather than a side) appears facing upwards. On either side of each edge the same number is printed (from 1 to 3). The numbers on either side of the up-facing edge are read as the result of the die roll. This long die cannot stand on end as the ends are capped. This is a prism that is thin enough to land either on its "edge" or "face". When landing on an edge, the result is displayed by digits (2–4) close to the prism's top edge. The triangular faces are labeled with the digits 1 and 5. Similar in constitution to the 5-sided die. Seven-sided dice are used in a seven-player variant of backgammon. Seven-sided dice are described in the 13th century Libro de los juegos as having been invented by Alfonso X in order to speed up play in chess variants. Each face is a rhombus. Each face is a kite. Each face is an isosceles triangle. 18 faces are squares; the 8 triangular faces are rounded and cannot be landed on. Each face is an irregular pentagon. Each face is a rhombus. Although not included in most dice sets, it can be found in most hobby and game stores. Each face is a scalene triangle. The faces of the 50-sided die are kites, although very narrow. 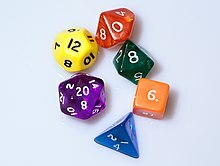 100-sided dice can be found in hobby and game stores. They are made by flattening 100 facets on a sphere, but are not truly "uniform fair dice". Dice may have numbers that do not form a counting sequence starting at one. One variation on the standard die is known as the "average" die. These are six-sided dice with sides numbered 2, 3, 3, 4, 4, 5, which have the same arithmetic mean as a standard die (3.5 for a single die, 7 for a pair of dice), but have a narrower range of possible values (2 through 5 for one, 4 through 10 for a pair). They are used in some table-top wargames, where a narrower range of numbers is required. Other numbered variations include Sicherman dice and nontransitive dice. Typical role-playing dice, showing a variety of colors and styles. Note the older hand-inked green 12-sided die (showing an 11), manufactured before pre-inked dice were common. Many players collect or acquire a large number of mixed and unmatching dice. Dice can be used to generate random numbers for use in passwords and cryptography applications. The Electronic Frontier Foundation describes a method by which dice can be used to generate passphrases. Diceware is a method recommended for generating secure but memorable passphrases, by repeatedly rolling five dice and picking the corresponding word from a pre-generated list. ^ "die". Oxford Dictionaries. Retrieved 14 February 2015. ^ "presstv.ir". presstv.ir. 11 April 2007. Archived from the original on 20 June 2007. Retrieved 18 June 2012. ^ Finkel, Irving (2008). "Board Games". Beyond Babylon: Art, Trade, and Diplomacy in the Second Millennium B.C. Metropolitan Museum of Art. p. 151. ISBN 978-1-58839-295-4. ^ Laird, Jay (2009). Encyclopedia of Play in Today's Society. SAGE Publications. pp. 171–173. ISBN 978-1-4522-6610-7. ^ Good, Alexandra. "Knucklebones". Johns Hopkins Archaeological Museum. Retrieved 16 April 2015. ^ Matz, David (2002). Daily Life of the Ancient Romans. Greenwood Publishing Group. pp. 94–95. ISBN 978-0-313-30326-5. ^ "christies.com". christies.com. Retrieved 18 June 2012. ^ "Twenty-sided die (icosahedron) with faces inscribed with Greek letters". metmuseum.org. Retrieved 28 March 2015. ^ Ronan, Colin; Needham, Joseph (1986). The Shorter Science and Civilisation in China. Cambridge University Press. p. 55. ISBN 978-0-521-31560-9. ^ Salter, Rebecca (2006). "Board Games". Japanese Popular Prints: From Votive Slips to Playing Cards. University of Hawaii Press. p. 164. ISBN 978-0-8248-3083-0. ^ "Casino Dice". www.dice-play.com. Retrieved 1 July 2018. ^ "Dice Sizes Explained". Dice Game Depot. 2018. ^ Cf. Greek Anthology Book 14, §8: "The Opposite Pairs of Numbers on a Die. The numbers on a die run so: six one, five two, three four." ^ a b "Standard Dice". Archived from the original on 30 July 2013. ^ "Chinese Dice". Elliott Avedon Museum & Archive of Games. Archived from the original on 1 May 2008. ^ "ace". AskOxford. Retrieved 18 June 2012. ^ Conant, Levi Leonard (1896). The Number Concept: Its Origin and Development. Macmillan. p. 124. ^ "Dice faces in block Miscellaneous Symbols" (PDF). The Unicode standard. ^ Peterson, Jon (July 2012). Playing at the World: A History of Simulating Wars, People and Fantastic Adventures, from Chess to Role-Playing Games. Unreason Press. pp. 315–318. ISBN 978-0-615-64204-8. ^ Paret, Michelle; Martz, Eston (2009). "Tumbling Dice & Birthdays: Understanding the Central Limit Theorem" (PDF). Minitab. Archived from the original (PDF) on 1 November 2013. Retrieved 29 September 2013. ^ Kybos, Alea. "Properties of Dice" (PDF). Archived from the original (PDF) on 28 May 2012. Retrieved 7 October 2012. ^ "games.rengeekcentral.com". games.rengeekcentral.com. Retrieved 18 June 2012. ^ "wwmat.mat.fc.ul.pt" (PDF). Retrieved 18 June 2012. ^ "Specialist D6". em4miniatures. Retrieved 18 August 2017. ^ a b "[TMP] 'What are Average Dice' Topic". The Miniatures Page. 20 November 2009. Retrieved 18 August 2017. ^ "Making better use of dice in games". 2 October 2014. ^ Guthrie, Kenneth (1988). The Pythagorean sourcebook and library: an anthology of ancient writings which relate to Pythagoras and Pythagorean philosophy. Grand Rapids, MI: Phanes Press. ISBN 978-0-933999-50-3. OCLC 255212063. ^ "EFF Dice-Generated Passphrases". Electronic Frontier Foundation. 12 May 2016. Retrieved 16 November 2018. ^ "EFF's New Wordlists for Random Passphrases". Electronic Frontier Foundation. 19 July 2016. Retrieved 4 December 2016. Look up dice in Wiktionary, the free dictionary. 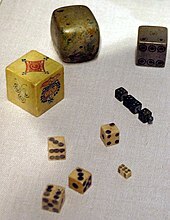 Wikimedia Commons has media related to Dice. This article incorporates text from a publication now in the public domain: Chisholm, Hugh, ed. (1911). "Dice" . Encyclopædia Britannica. 8 (11th ed.). Cambridge University Press. p. 176–177.